Buyers Beware! Mac App Store Purchases Might Not Be What You Expect! For all the convenience of the Mac App Store, sometimes buying your software directly from Apple isn’t the best choice if you want to get all the features and functionality an app is capable of. Why? As the case of Bare Bone Software’s popular text editing program BBEdit makes clear, the devs of some of the best software on OS X have been forced to cripple their apps in order to comply with Apple’s Mac App Store developer guidelines. As we posted a couple of hours ago, BBEdit has just made its Mac App Store debut, at its lowest price yet. Users who click the “Buy” button for BBEdit in the Mac App Store may be disappointed after the app downloads though. 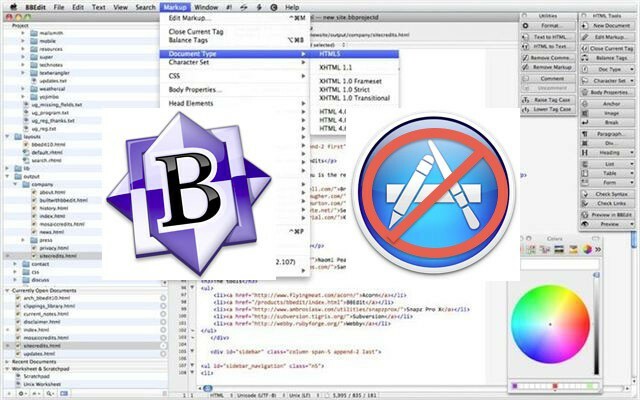 The app has several limitations compared to a version of BBEdit purchased directly from the developer. Are there any differences between the Mac App Store versions of your software and the versions available directly from your website? Yojimbo is functionally identical whether you purchase from our online store, or from the Mac App Store. In BBEdit and TextWrangler, authenticated saves (the ability to save changes to files that you do not own) and the command-line tools are not available in the Mac App Store versions, in order to comply with Apple’s submission guidelines. For customers using BBEdit or TextWrangler purchased from the Mac App Store, we have installers available which will install the command-line tools in your system. Please note that these are only for use with versions of BBEdit or TextWrangler obtained from the Mac App Store, and are not suitable for use otherwise. Authenticated saves will not be possible in versions of BBEdit or TextWrangler obtained from the Mac App Store. If you desire this capability, please purchase BBEdit directly from us or download TextWrangler directly from us. If you have already purchased BBEdit from the Mac App store and need support for authenticated saves, please contact our customer service department for assistance. We will require proof of purchase from the Mac App Store in order to assist you; if you include that information when you write us, doing so will speed the process. If you are a software developer, advanced user, or administrator the missing features highlighted above are serious omissions from the Mac App Store version of BBEdit. As a user who is all three of the above — dev, admin and advanced user — I’m glad I looked carefully before updating to BBEdit 10 via the Mac App Store. I would have lost the ability to edit system files or other files that I do not own. It’s not just existing BBEdit users accustomed to these features who are getting burned here, either. New users purchasing BBEdit from the Mac App Store would not be able to use many of the defining BBEdit features that their peers speak so glowingly about. How confusing is that? The lesson here is to look carefully before you buy software from the Mac App Store. Compare what the Mac App Store has to offer versus what the developer offers directly. In BBEdit’s case, the choice where to shop is obvious: straight from Bare Bones’ official site.